Fungal nails (aka Onychomycosis) refers to any number of fungal nail infections that can occur on the foot. Since fungal nails are usually more resistant and more difficult to treat than Athlete's Foot, topical or oral antifungal medications may be prescribed. Note: Please consult a physician before taking any medications. Topical Antifungals: this is a liquid, cream, or lotion applied directly to the nail a nd surrounding skin to kill the fungus. 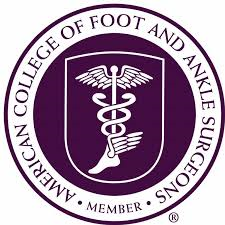 Summit Podiatry Group is proud to carry the premier topical antifungal solution. This easy to use, safe, and effective topical agent is available for purchase in our office. 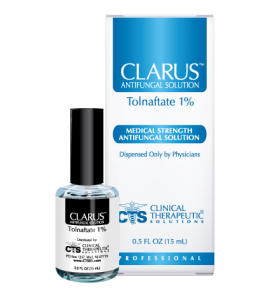 Ask your doctor about this product which is called CLARUS ANTIFUNGAL SOLUTION. OOoOral Antifungals: Prescription antifungal medicines taken by mouth may help clear the fungus. Typically these medication need to be take for 3 months or longer to completely irradicate the fungus. Your physician may check blood work to check for liver damage while taking this medication. Nail Removal: Temporary of permanent nail removal can easily be performed in the office under a local anesthesic.